As you can see, it has been quite awhile since I've written anything here. The road has been quite bumpy lately, to say the least. In late October, mom really went 'downhill' quickly. I packed my bags and headed over to mom and dad's. The moment I walked in the house and saw mom, I knew. That night, she and I had a wonderful heart-to-heart about her wishes, her plans, my fears… a pure mother-daughter bonding time. Lots of tears mixed with tremendous love and joy. We took her to the hospital the next day, thinking they'd give her an I.V. and send her home that night or the next day. That wasn’t God’s plan. One thing led to another in the hospital, and mom regressed even more quickly. She died two and a half weeks later. Yet, thankfully, God was gracious enough to sprinkle those weeks with just as many blessings and wonderful moments to hold on to forever. I am eternally blessed to have witnessed such incredible displays of love between my mom and dad, mom and my children, mom and her sisters, mom and her friends… and of course, mom and I. I’m also blessed to have witnessed mom’s enormous strength and courage. I also saw what it really, truly means to be joyful and gracious. Mom was beautiful at the deepest levels even as she struggled through the limitations of her physical body. What a woman of grace. Who knows what the “right” thing to do was – going to the hospital where mom seemingly suffered quite a bit more, or keeping her in the ‘comfort’ of her home. I can choose to beat myself up about that one for the rest of my life, or I can accept that it was all part of God’s plan. If we decided to keep her at home, mom surely would have died two weeks earlier. 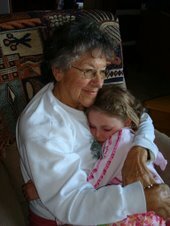 Perhaps this would have prevented some suffering, but it would have also eliminated any of the opportunities for intense demonstrations of love and bonding granted to our family in mom’s final days. Maybe it’s selfish on my part, but I AM glad that we had those extra two weeks to share with mom. I think she is, too. I’ve got many thoughts, theories, stories and lessons-learned to share as a result of this journey with mom. Thoughts about the potential causes of the epidemic of breast cancer, biopsies, mammograms, dissecting the human lymphatic system, hormonal therapy, palliative care and even the parallels between dying and giving birth. I also hope to help others by sharing my game plan for getting back on track with my own physical, mental and emotional health after months (years, actually) of exhausting stress. I just needed to write this first article and get rid of the ‘post-traumatic writer’s block’ I’ve been experiencing! NOW the floodgates can really open! Just like those weeks in the hospital with mom, I find that my life these days is a roller coaster of emotions – intense sadness followed by pure happiness and laughter followed by more sadness, more joy... all fairly natural, I’ve been told! I find peace and calmness when I remember to look for the blessings in each moment, to feel grateful for everything God has given me, and to choose happiness rather than sorrow and pity. It was a great woman who shared such simple, yet profound advice with me. It was my mom! I know this is an older post, but I know the pain doesn't really go away. I lost my Mom to breast cancer in July of last year. My baby was only 8 months old and I can't believe he will live this life without the most wonderful woman I've ever known. A hug to you, you are not alone. You are a great daughter. My wishes and prayers are always there for you. Get back strong and write for us.